Whether you have an online record store or your own clothing apparel, here’s why you should consider SSL protection. With the passing of another year, could 2017 be the year that you really get ‘on top’ of your website? Start afresh and bring your A-game, as they say. Whilst there are a number of things you could do to give your website that much-needed refresh, we’ll be focussing on SSL Certificates in this blog. A. SSL stands for Secure Sockets Layer. Q. What do SSL’s do for websites? A. SSL’s encrypt data, inputted by the user to your site – keeping the data (which could be card details) safe and encrypted from hackers or other malicious intercepters. Data is encrypted (put into unreadable format/scrambled) after the user enters the data and then sent to the intended recipient. When the data reaches the intended recipient, it is then unscrambled/decoded and stored safely. Q. How do I know if a site is using SSL? A. When a site is using SSL, the URL (the link in the address bar) will change from being ‘http://’ to ‘https://’. You may also notice a green padlock icon appear, shown in the picture. So why should I bother getting one? There are a number of reasons to answer that question. As above, SSL certificates offer encrypted data – meaning data shared between your website visitor/user and the server, is kept encrypted – deeming it scrambled and illegible to a hacker. Why else? Believe it or not, you now must have an SSL certificate set up properly in order to process card payments online, in alignment with the guidelines set out by law. More info on this here. Since Google changed their algorithm some time ago now, websites using SSL certificates are typically ranked higher in search results because of increased credibility. So really a win-win all round! Ready to take the next step? Ask us about SSL certificates or place your order today. 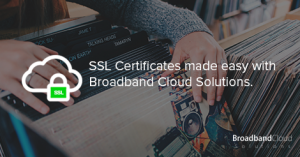 We’re currently offering 3 years for the price of 2 on our SSL certificates too. With same-day installation, we’ll have your site secured within hours of purchase.